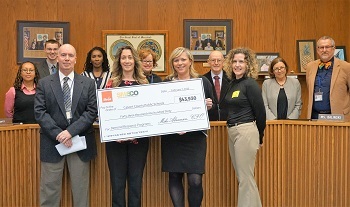 For the eighth year in a row, Calvert County Public Schools (CCPS) was recognized for energy conservation through participation in the Demand Response Program, jointly sponsored by CPower, a demand-side energy management company, and the Southern Maryland Electric Cooperative (SMECO). The school system will receive nearly $90,000 in rebates and bill credits for reducing energy consumption. CPower works with SMECO and other utility companies to administer their load control programs to ensure affordable power during peak demand times, which usually occur during the summer. To avoid paying for higher priced energy at times of high demand on the electric grid, large consumers, such as CCPS, are asked to curtail their energy use during these peak times to offset the increased demand. As compensation for participation and performance, CCPS annually receives a credit from SMECO based on the actual amount of decreased consumption, as well as a matching check from CPower. The money received will be reinvested in schools to further reduce energy consumption, including installing energy-efficient fixtures and upgrading HVAC controls. By the conclusion of the 2017-2018 school year, CCPS reduced its overall annual consumption of electricity by 17.17% since 2008 by installing energy-efficient equipment and encouraging people to change behaviors to conserve energy.